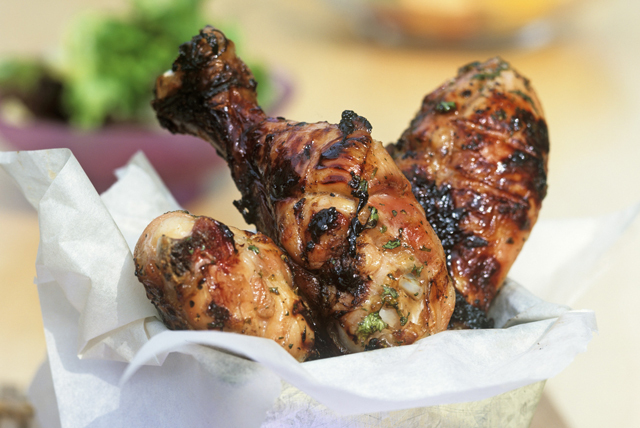 Try our simple and easy recipe for "Greek-Style" Grilled Chicken Drumsticks. Start by marinating the chicken in Greek dressing, then finish off the drumsticks on the barbecue. Mix 1/3 cup dressing with next 3 ingredients until blended. Pour over chicken in shallow dish; turn to evenly coat both sides of each drumstick. Refrigerate 1 hour, turning chicken occasionally. Heat barbecue to medium heat. Remove chicken from marinade; discard marinade. Grill chicken 25 to 30 min. or until done (165ºF), brushing with remaining dressing for the last 10 min. Garnish with fresh oregano before serving. When brushing poultry, meats or fish with sauce during grilling, be sure to discard any unused sauce. Then, serve the grilled food with fresh sauce to ensure that no bacteria from the raw meat contaminates the cooked meat.